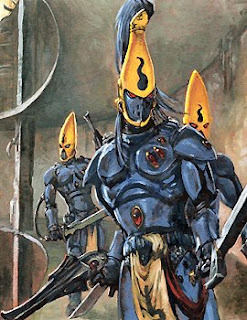 "Occasion, servants of the Almighty Emperor may be fortunate or skilled enough to capture an Eldar alive. The majority of those who fall into our hands are from that caste known by our military forces as the Rangers. These Rangers can provide us with much information about their people, under correct inducements. Over the last two millennia, a surprising proportion of these captured Rangers hailed from the craftworld of Alaitoc. Perplexed by this course of events, my predecessors began a detailed analysis of this craftworld which I have attempted to continue. This has been a very hard task, as Alaitoc is one of the most secretive craftworlds, drifting on the very edge of the galaxy. Ever since war broke out between them and the Emperor's righteous armies, following the Beelze Conflict, they have shunned all direct contact with other races. Intrigued by the propensity for the Alaitoc Eldar to follow the so-called 'Path of the Outcast' I endeavoured to find the root of this from amongst their number. The information I managed to elicit was interesting but unfortunately the subject died before it could reveal anything of depth or detail. It appears that the Eldar of Alaitoc are the most puritanical adherents to the culture known as the Path of the Eldar - that lifestyle by which an Eldar will dedicate itself to the pursuit of knowledge in one sphere of life at a time. This zealous attitude has led to many of the Alaitoc Eldar becoming Rangers - either made outcasts by their masters for some slight misdeed, or tiring of the harsh discipline of their craftworld. For some, the very isolation which the Alaitoc Eldar value has only served to heighten their curiousity and inquisitiveness regarding the greater galaxy. Although disenchanted with their craftworld, those on the Path of the Outcast still remain loyal to Alaitoc and many of them return to it in due course. Due to its isolation, the craftworld makes much use of its many Rangers to gather news, keeping it informed of the actions of other craftworlds and alien races so that the Alaitoc Eldar might respond if necessary. When the Alaitoc fight a war, they gather their many Rangers through the webway, sending them ahead of their main force to sow disruption and anarchy in their enemy's army. The Rangers are highly skilled at destroying supply dumps and ammo caches, pinning down units trying to attack and generally breaking apart any coordination and cohesiveness the enemy army might have. When the Alaitoc make their major attack, the enemy will already be half-defeated - having spent days or even weeks chasing shadows, they will be desperately trying to gather together the fragments of their army into a fighting force." Alaitoc craftworld lies in the eastern edge of the galaxy, the frontier region which has never been reconquered by the Imperium. Before the days of the Imperium it was colonised by humans, Orks and Eldar, and even now it remains a sprawling zone of border empires and outlaw worlds. This melting pot of races and cultures lies far away from the immediate threat of Chaos, but even so the threat cannot be ignored. Numerous parties of Eldar Rangers, who retain their ties to the Alaitoc craftworld, explore and patrol the thousands of worlds beyond the reach of the Imperium. They secretly monitor the isolated civilisations and strange races that live there. 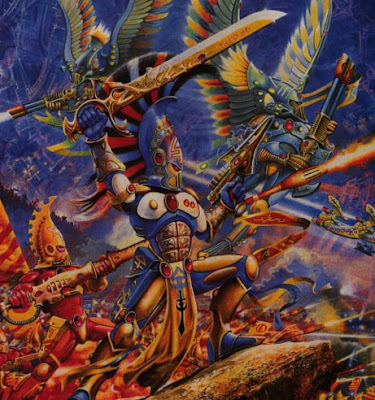 All Eldar craftworlds have Rangers, but the stringent devotion to the Path of the Eldar that inhabitants of Alaitoc follow means that this craftworld produces a greater proportion of scouts than any other. The sword symbol of Alaitoc represents the Sword of Vaul, the weapon forged in the Smith God's desperate battle against Khaine the God of War. It represents the defiance and determination of its people, a sign that no matter how hard the fight the Eldar will never abandon it. Alaitoc is associated with the colour blue, or with the mixture of blue and yellow. However, the Pathfinders and Rangers who accompany the forces of the craftworld to war wear camouflaged coats that blend into their background. The Eldar are an incredibly ancient alien race, who once ruled a vast empire across the stars. Then came the hideous times of the Fall, when the Eldar fell from power. Though they are now few in number, the Eldar are one of the most technologically advanced races in the galaxy. The story of the Eldar is one of regret and decline. Millennia ago, their race held the galaxy in their grasp. Their power was great; the Eldar could reshape entire worlds by the power of thought alone. Nothing threatened their dominance, and the Eldar began to lose themselves in the decadence of their comfortable existence. However, their decadent indulgences exacted a terrible price. Unbeknownst to the Eldar, the energy from their depravity had caused increasing disturbances in the Warp. Eventually, these disturbances coallesced into a Chaos god who came to be known as Slaanesh. When Slaanesh was born, the energy from his birthcry travelled through the Warp and obliterated the minds of the majority of the Eldar race. The few survivors, scattered on craftworlds on the edge of the galaxy, realised what had happened and committed themselves to avoiding the same fate. By devoting themselves to self-discipline, the remaining Eldar avoided the decadent follies of their brethren. Now, the Eldar fight to keep their ancient race from extinction.